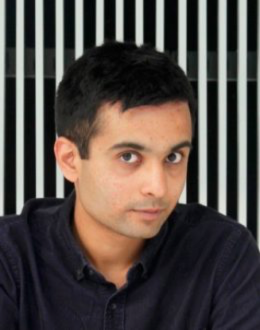 Dhairya is an award winning researcher, designer and engineer, currently running ODD Industries (futurist factory X lab) in NYC, and sits on the advisory board of the XPRIZE Foundation. Dhairya’s work investigates the human body as a medium for computation, new materials as a tool to embody interactions and design as a vehicle for mindfulness. His work is situated in the belief that human well-being in an increasingly computational world can be achieved at the intersection of thoughtful design, innovative engineering and radical paradigms. Most of his work is quirky, funny, provocative and ugly. He has created shoes that tickle, a 2.5D malleable elastic display, synthetic muscles, ice-cubes that know how much you drink, toys made from electronic waste materials, emotionally intelligent flowers, wearable telepresence apparatus, optically invisible fibre-optics among other useless/useful inventions. In Seattle, Dand was part of Amazon’s secretive Concept Lab, where he is credited for key inventions and Alexa devices. Some of his inventions which are public, involve invisible interfaces and using hand gestures to use the air as a medium for computing. His work has been exhibited at various places around the world including the V&A, MIT Museum, Singapore Arts House; his research published at academic conferences including CHI, TEI, UIST; and has been written and interviewed in the New York Times, Wall Street Journal, TIME Magazine, CNN, BBC, ABC, Forbes Magazine, NPR, Discovery among others. He has given keynotes at major international technology and innovation forums including; W3C Annual Summit, Tencent, TEDx, 72andSunny, Second Home, INK Talks, Contagious Future Flash, MIT Museum and WIRED. He was part of the Forbes ’30 under 30’ list, ELLE’s ’20 Names To Know’ list, was named as the first WIRED Innovation fellow ‘innovators who will change our world’ and an INK Fellow, part of Globe’s ‘Top 25 Innovators’ list, the Smithsonian’s National Design Award and Vogue’s ‘Cool People’ list. Previously he was a researcher at the MIT Media Lab in Boston and prior to that he was an amateur geologist in Saudi Arabia, a sensorial researcher in Tokyo, a toy designer in Phnom Penh, activist and researcher in Singapore, social-political entrepreneur/researcher in Bombay. He holds a master’s degree in Media, Arts and Sciences from the Massachusetts Institute of Technology, where he studied at the Media Lab with Pattie Maes (Fluid Interfaces Group), Henry Holtzman (Information Ecology Group) and was advised by Jun Rekimoto (University of Tokyo/Sony CSL), Ethan Zuckerman (Civic Media) and Philipp Schmidt (P2PU). He has also taught semester-long studio-focused graduate courses at the Art Institute and several week-long innovation workshops with the MIT Media Lab Initiative of which he is also the Founding Director.